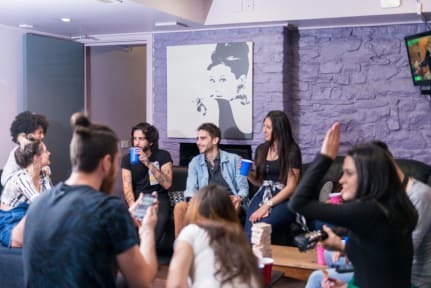 We're a friendly and clean Backpackers hostel located in Dublin's vibrant Village Quarter just off Camden Street in the heart of Dublin 2 and a ten-minute walk to Temple Bar, Grafton Street and Trinity College. Free 24h coffee break! Have a cup of tea/ coffee or hot chocolate any time! Free ice cream party every Monday! Free Wine & Cheese night every Tuesday! Welcome drinks on Fridays to kick off the weekend! Lounge with TV and library! Free DVDs and board games! We want all our guests to have a great visit to Dublin! Our friendly staff is happy to help you out with questions, ideas and guide you to the sights, best restaurants, pubs, and clubs in Dublin. Many of them are just around the corner. We also offer tours so you can explore the rest of Ireland! Our staff can book them for you and answer your questions. Linen is free and you'll find free city maps in reception. Choose between eleven room types: Mixed dorms, female's only, private dorms and private doubles/twins. We're tucked away in a side street just off of Camden Street. Dublin buses and LUAS are right outside our door. Bus 16 (one-minute away) will take you straight to and from the airport! We also offer an early morning shuttle (€7). So come join us! Explore Dublin and stay at The Times Hostels - Camden Place. Children under the age of 16 must be booked into private rooms. All cancellations must be received 48 hours before to your arrival date. Check-in starts at 14:00. Amazing experience there ! The employee are really nice and kind to everybody ! I am fully recommending Times Hostel! Such a GREAT STAFF, helpful (if like me you need information about PPS number or Irish Bank account), friendly and professional. You can enjoy everyday a free event, really great to meet new people around a free diner, tapas or Sangria. I stayed in a 10 beds room, the room was very big and cleaned everyday. A kitchen is open 24h/24 which is really useful. More over you have lot of spaces if you need like me to study quietly. Thank you for all your help! Great week spent to Times Hostel... the staff is really nice and helpful ! I highly recommend ! Tout super sauf : Emplacement : Petit bémol pour le niteclub, ms bouchons d'oreille offerts et ça ne fini pas trop tard (pour une boite). Bon rapport qualité/prix : Ça va. Par contre prix variables pour la même chose disponibilité, je trouve ça un peu dégeu (32€ en réservant ma nuit de retour sur place, pour une nuit dans un dorm qui était à 18€ le jour où j'y ai dormi) Un politique tarifaire unique au moins sur la haute saison serait le bienvenue. I had a good time at Times Hostel. People were friendly and the room was clean and nice. Un bon endroit pour rencontrer des gens et dormir à moindre coût donc je recommande fortement ! Auberge sympa avec toutes les facilités nécessaires pour les backpackers : café, thé et chocolat chaud à disposition. Chaque soir une activité différente : souper gratuit, sangria, etc. Seul petit bémol est l’agencement de la pièce commune qui n’est pas idéal pour rencontrer les autres backpackers. Le personnel est très sympa. +: Good location, nice staff, good breakfast, clean. Bed sheets were clean and cozy -: It was very noisy (both from dorm travelers, the street (annoying dog barking outside the window), and laundry machines still running at 11pm), and the mattress was uncomfortable (where you feel the springs in the mattress).